"To spin or not to spin?" That is the question. Check out these TaylorMade TP Reds. This is one of TalylorMade's premium golf balls designed for lower handicappers with high swing speeds. This ball is a multilayer ball with four pieces, a soft core, two mantle layers, and a Uerathane cover. It is identical to the TP Black with the addition of the second soft mantle layer that reduces spin on short irons. This second mantle layer also lowers the balls compression which causes it to fly lower on those wedge shots as well. This ball matches up very well to the Pro V1x which is my favorite golf ball on the market. The difference between the TP Red and TP Black is equivalent to the difference between the Pro V1x and the Pro V1. The biggest difference being that the former (Pro V1x and TP Red) have less spin with the short irons, and the latter (Pro V1 and TP Black) have more spin and are more workable. All these golf balls that I mentioned above have a nice soft feel and go very long off of the tee. 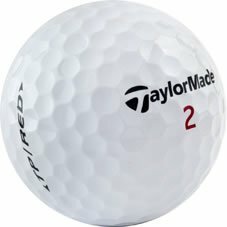 The TP Red is a very good golf ball, and I would recommend it for those experienced golfers who are having problems spinning their wedges off the green. "I spin, therefore I am."